A lot has happened since I first recommended Plug Power (PLUG) as a speculative buy in October of 2013. 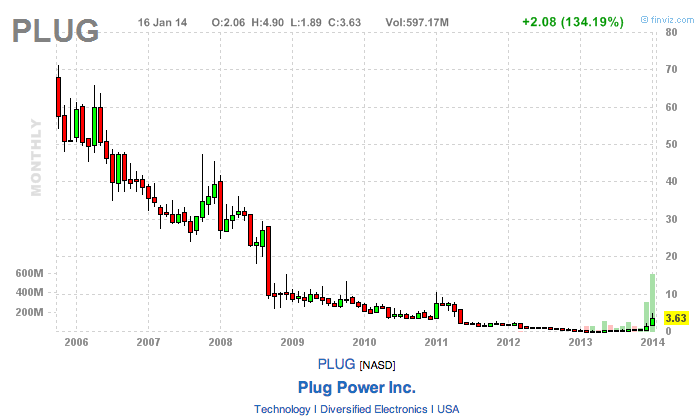 Plug Power, along with its share price, has transformed dramatically in such a short period of time. The company went from being lost and forgotten to one of the most hyped stocks of 2014 in the snap of a finger, so popular that Plug Power's website servers could not handle the high volume of traffic they experienced right before the business update that occurred on Thursday morning. There was a major flaw in my first write-up on Plug Power, and that was the fact that I underestimated the timing and the magnitude of the potential return the shares could have generated. You can see it right in the title. Instead of generating 100% upside in what I expected to be at least six months' time, the shares of Plug Power have generated more than 500% in less than three months. Plug Power has positioned itself for an extended period of remarkable growth thanks to more than 5 years of testing, investing, and continuous product development. Finally, after nearly 17 years of existence, the company is on the verge of recording its first ever profit, and with a growing buzz surrounding the fuel cell industry, increased interest for Plug Power's solutions from businesses across the globe, and a rapidly expanding target market, the shares offer patient investors more than 100% upside. Plug Power has received a lot of criticism lately from both investors and commentators, likely due to the astonishing momentum that drove up its share price and the idea that the move was unwarranted and unsustainable. When people were calling for a correction, the shares kept leaping higher. The stock is now holding on to a solid chunk of its gains and is in the midst of moving sideways and consolidating, similar to December's price action. The stock has more than doubled in January alone, but the long-term potential of this run is just beginning to unfold. 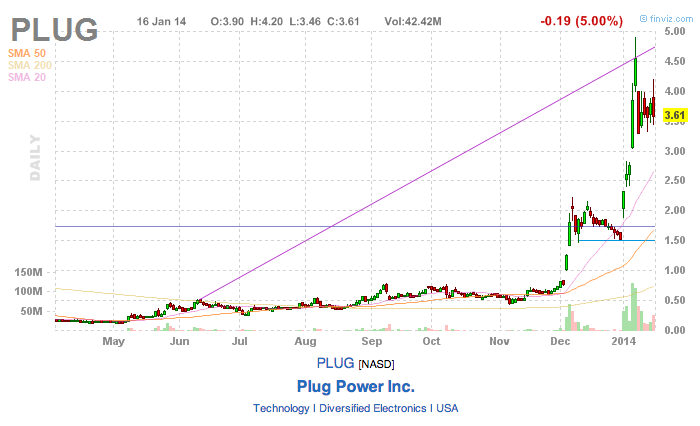 Most articles that criticized Plug Power's ability to sustain the recent monster run and called for a significant price correction were focused on information that has little relevance to the company today. Some of the information presented in Dr. Hugh Akston's second bearish piece was so off that Plug Power CEO Andy Marsh directly addressed this in Thursday's business update. Dr. Akston claimed the idea that Plug Power's GenDrive products providing any tangible benefit over existing technology was nothing but fiction. Specifically, he claimed that Plug Power's GenDrive units only run at an average rate of four hours, compared to six hours for a traditional electric battery (anecdotes sourced from unidentified fortune 500 warehouse managers). Investor: I'm wondering your run rate, where is it compared to the 6-8 hours you are expecting or promising? Andy Marsh: It exceeds or meets it. I've heard some rumors, you know I read some rumors and I heard someone mentioning 4 hours, and I think they probably were thinking about our old 200 bar systems from about four or five years ago. We operate at 350 bars, and some of it is dependent upon the operation, how heavy the units are used. I know some of our pallet trucks can operate for over 12 hours, some of our class one products easy get 7-8 hours of operation. I heard those rumors, and I think sometimes people have old information, and I understand that. Clearly, the argument that Plug Power's fuel cell solutions don't provide any tangible benefit over existing battery technology can be thrown out the window. Not to mention the fact that Plug's GenDrive offering reduces emissions by up to 80% and frees up a large battery charging room that takes up 5%-7% of space in warehouses. The sheer magnitude of the recent positive developments is jaw-dropping for Plug Power, and with new markets waiting to be entered, some that may eclipse the market potential of Plug Power's already established material handling market (a $20 billion market), one needs to take a step back and look at the bigger picture to understand the true potential of this sleeping giant. It should be noted that these business updates were scheduled months in advance and merely serve as a platform to increase transparency between the company and its shareholders. Nonetheless, expectations were high for this business update, maybe a little too high. The share price ran up more than 10% prior to the call, took a tumble in the middle of the call, and finally settled 7% lower for the day. Regardless, the call served as a testament to the increase in business Plug Power has achieved in recent months and will continue to experience in the months moving forward. Here are some highlights from the company's update. -Booked new orders with Wal-Mart (WMT), Kroger (KR), BMW, Mercedes Benz. -Mercedes Benz recently received more than 100 GenDrive products at their new distribution center in Alabama. Mercedes is a growing customer for Plug Power, and it is being viewed as a global target. 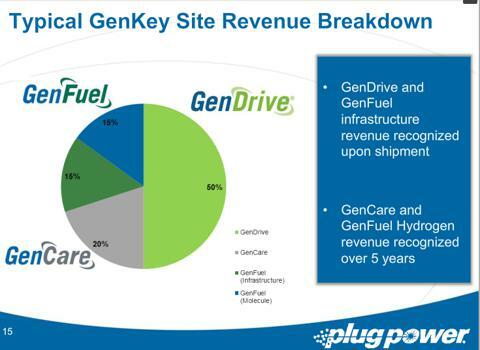 -Booked a GenKey deal with Kroger that will include more than 200 GenDrive units. Plug will be providing the hydrogen, hydrogen infrastructure, the product, and the service. This site will be deployed in the second quarter. -Received an additional order from Kroger (product only), which will be deployed in the third quarter. Plug is currently negotiating with Kroger to include the GenKey solution. -There has been global interest from both new prospective customers and current customers who are looking to deploy electric utility vehicles that utilize Plug Power's range extenders for home delivery of their products. This is an exciting opportunity to expand Plug Power's business with minimal product development and with many current customers. -Plug Power now has a fully-funded business plan. The company has $46 million in the bank, and expects to use less than $10 million in operating cash this year. -1Q 2014 bookings will exceed the bookings of 4Q 2013's $32 million. These 1Q bookings will be sufficient to meet the revenue targets Plug Power has set for 2014. -Plug Power will sign two additional GenKey deals in 1Q 2014. -Jose Luis Crispo, an experienced international businessman, has joined the International Sales and Business Development division and will be focusing on Asia and new markets for Plug Power. Marsh and Crispo will be in Asia next week exploring business opportunities. After speaking with Andy Marsh over the phone, Crispo said simply, "I would not be traveling to Beijing and Shanghai in the middle of winter for fun." -Plug Power is expecting to sell more than 3,000 GenDrive units to 20 different manufacturing facilities/distribution centers. This would put its operations in the profitability zone for 2014. 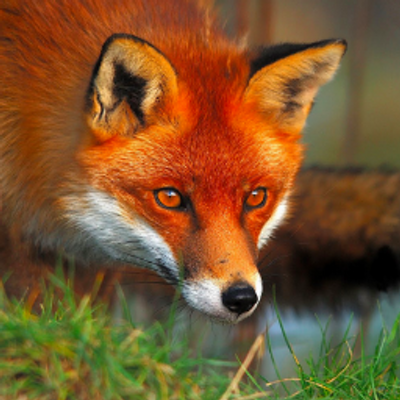 The company will deploy its first GSE, TRUs, and range extenders to customers this year. -Plug Power expects to achieve breakeven EBITDAS by the second or third quarter of 2014. -Plug Power has more than $50 million in booked orders as of 12/31/2013. These orders are expected to be completed and recognized as revenue within six to nine months. -Plug Power has rebranded its turnkey solution as GenKey, which allows it to be a single-source vendor for all fuel cell needs of a prospective customer. Plug will be providing key data that will allow customers to view the performance of their units and obtain a sense of the cost savings, emission reductions, and increased productivity that occurs when you switch from a traditional battery/diesel-powered fork lift to Plug Power's GenDrive alternative. Plug Power has shortened its deployment time for the GenKey solution to four months. It's difficult to fathom the massive market that Plug is currently situated in. Plug Power's goal is to become a dominant player in multiple vertical transportation markets. This includes the material handling market (forklifts), the Transportation Refrigeration market (TRUs), the ground support equipment market (airport vehicles), and the range extender market. Plug Power already dominates 90% of the material handling fuel cell market, and this dominance should spread over to other vertical markets that it is targeting since many of the company's current customers utilize products across many of these markets. Plug Power's current list of customers operate a total of 250,000 battery-based forklifts in the U.S. Assuming that Plug's GenDrive offering costs an average of $23,000, the market potential for Plug Power is approximately $6 billion in the U.S. alone. Keep in mind that more than 6 million forklifts are deployed worldwide. The loud diesel engines that power the refrigeration units attached to 18-wheelers are due for an upgrade. Just about every single dairy, produce, or meat product from your local supermarket sat on a diesel powered TRU at some point. The diesel-powered TRUs are loud and inefficient when compared to Plug Power's fuel cell offering. The company's offering reduces noise pollution significantly, which allows for nighttime deliveries of products in noise-sensitive areas and results in a reduction of emissions and costs. The ability of massive food retailers to deliver goods at any time of the day without worry of noise violations will vastly improve the logistics for these giant companies. There are approximately 300,000 TRUs operating in America alone. While there is no specific price point for Plug's TRU offering, it's safe to say that it will cost significantly more than a forklift GenDrive unit. If we assume Plug's TRU offering costs ~$50,000 per unit, that would equate to a U.S. target market worth nearly $15 billion. There are more than 26,000 units operating in the U.S. If we assume costs similar to the GenDrive units, the potential revenues generated in the U.S. would represent nearly $1 billion. The European market for ground support equipment units is 20%-30% larger than the U.S. market. FedEx (FDX) operates a fleet of more than 70,000 trucks, [[UPS]] operates more than 90,000 trucks, and USPS operates over 130,000 trucks. If we assume a price similar to the GenDrive units, these three truck fleets represent combined potential revenue of more than $5 billion. Obviously, these customers could not replace all of their trucks with electric trucks utilizing Plug's range extenders overnight, but a transition of a couple of thousand trucks a year does not seem out of reach. When you consider the logistics hungry characteristics of UPS and FedEx, and strong interest for the product from several of Plug's current customers, the US market alone can easily exceed $20 billion. 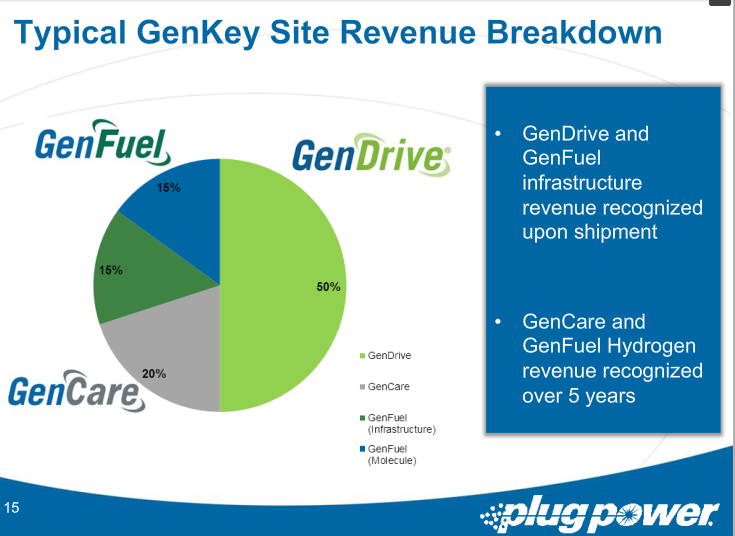 One GenKey site provided by Plug Power generates $8-$12 million in revenue, with 35% being recognized as recurring revenue over a 5-year time period and the other 65% being recognized upon shipment. Kroger alone operates 37 distribution centers and recently became Plug Power's first customer of this service. Kroger decided to go with GenKey because Plug Power takes away all the internal activity needed to train staff with building and servicing the necessary hydrogen equipment. Wal-Mart operates 158 distribution centers. The GenKey revenue potential of these two customers alone is more than $2 billion, of which $700 million would be recognized as recurring revenue over five years. The GenKey solution appeals to both new and current customers, as it serves as a simple transition to utilizing Plug Power's fuel cell offerings. Keep in mind that none of the above numbers take into account any of the European markets that Plug is already targeting through its partnership with Air Liquide, and the fact that the costs of the GenDrive and future Plug products have not been made public. This is a rough estimate that points to a combined U.S. addressable market of nearly $50 billion. The fuel cell industry saw tremendous amount of hype once it debuted in the 1990s, which was one of the factors leading to Plug Power's drastic price action after its initial debut as a public company. The technology back then was not ready for commercialization, but after nearly two decades of constant improvements, fuel cells are finally ready to make a comeback. Plug Power's resurgent business model illustrates how viable this alternative technology is, but Toyota (TM) is taking fuel cells a step further. Toyota has been excited about fuel cells for some time, and at last week's 2014 CES event, Toyota unveiled its fuel cell concept vehicle, announcing plans to introduce it to the market in 2015. Bob Carter, Toyota's Senior Vice President of automotive operations, believes the company's fuel cell vehicle represents what the Prius represented 15+ years ago; a compelling technology that received criticism and was slow to catch on at first, before becoming the best selling hybrid vehicles and one of the top selling cars in the world. Carter specifically called out Elon Musk and other fuel cell critics directly, and is adamant about the success of this technology. Interestingly enough, Toyota has teamed up with Plug Power's partner, Air Liquide, to build more than 100 fuel cell stations between four major Japanese cities within two years. The automobile company is also targeting California due to their growing base of fuel cell stations, expected to reach 30 by 2015. 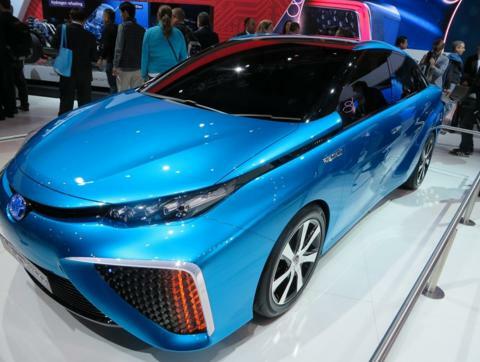 Toyota claims 68 fueling stations between San Francisco and San Diego could support 10,000 fuel cell cars. As the fuel cell industry increases in size and awareness and enters the mainstream, more investors will be looking to gain some exposure to this market. Plug Power is a pure play on the fuel cell market, and is poised to benefit from the increased attention the fuel cell market is beginning to receive. As many critics have pointed out, Plug Power has never been profitable in its 17-year existence and the company has a massive accumulated deficit. After nearly two decades of jumping from market to market to market with failed fuel cell products, it has finally found a successful niche area that will propel the company to profitability and enable dominance of its targeted fuel cell markets. Plug Power has a history of diluting its shareholders, and the company recently closed a financing deal worth $30 million with a single institutional investor. The financing consisted of 10 million shares sold at a strike price of $3.00, and 4 million warrants that have an exercise price of $4.00 per share. This is a bullish signal for Plug Power; being able to achieve financing at these levels indicates that this institutional investor foresees a strong future ahead for the company. Plug Power's current capacity can handle the production of 7,500 GenDrive units, or approximately $200 million in revenue. At some point down the line, the company will be required to expand and build out capacity, which may be financed through another secondary offering of shares or through a newly established credit line from a bank. In any case, long-term shareholders should welcome these types of growth-induced expenses. This stock is not for everyone. This is a volatile stock that can have 20%+ price swings in one trading session and is subject to heavy day/swing trading. The shares of Plug Power have more than doubled from their 2013 closing price, and are more than 25% below their recent high of $4.90. The fundamentals are in place for Plug Power, now it's up to the company to execute and prove to its critics that the long-term viability of the company and its business plan is stronger than ever. Plug Power will be holding a conference call on March 13th to announce year-end results and provide a quarter-by-quarter financial projection for the coming fiscal year. This conference call will act as confirmation that the company is on the verge of hockey stick growth, but any hiccup in earnings can result in a sharp sell-off. Only investors who have an appetite for risk should initiate a position at these levels, and a long-term outlook is necessary to reap significant gains. Plug Power is positioned to dominate multiple fuel cell transportation markets, which have combined potential revenues of nearly $50 billion in the U.S. alone. While this number pales in comparison to what Plug is booking in revenue today, it is a clear illustration of the true long-term potential for this company. While 2013 was a big year for Plug Power, avoiding a potential bankruptcy and reverse split, 2014 is gearing up to be an even bigger one. Impending profitability will serve as a confirmation to investors that this party is just getting started, and any development regarding a joint venture based in Asia or an announcement mentioning newly-added customers (Amazon highly anticipated) would serve as a significant growth catalyst for Plug Power and its share price. The shares of Plug Power should be subject to range-bound trading for some time until a significant announcement is made by management or management execution is shown in the numbers of the upcoming earnings call. Current and prospective investors should tune in for Plug Power's conference call/earnings release on March 13th and a business update on April 9th, and act accordingly depending on their risk tolerance/time horizon. Information was sourced from previous business updates. No Comment to " Plug Power Offers Patient Investors More Than 100% Upside, Part II "